• Our theory is this plane was sent from the replacement depot to replace one of the 857th planes given to the 458th BG for PROJECT AZON. It arrived shortly after the 19 May mission and was used to replace one of the three planes lost on that mission. We do not know which plane it replaced but most likely it was either 44-40088 or 42-110151. 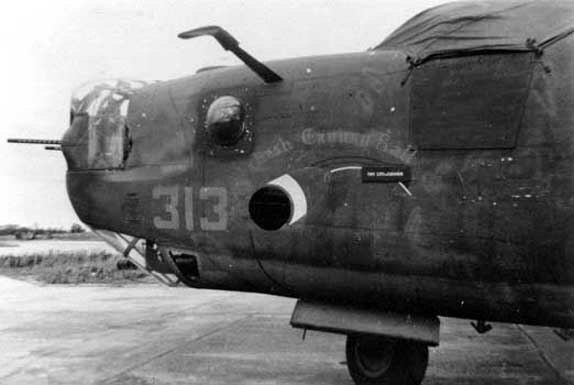 • By 4 Jul 44, this plane was reassigned to the 856th BS to replace 41-29470 which was lost on 23 Jun 44. Our theory is since the 857th borrowed and lost 41-29470, they owed the 856th another plane. So they gave them this one. • 18 Jul 44, aircraft made an emegency landing at an allied-held airstrip in France. By the time it was repaired, the 492nd had been disbanded. • Transferred to the 392nd BG, 578th BS. • The photo above is believed to had been taken while at the 392nd BG. • After being used for a whopping total of 91 missions, it was returned to the USA 29 May 45. Page last modified Sunday, January 3, 2010.